In today’s post I’d like to share how I took an unexpected recipe disappointment and turned it into a success. A few weeks ago, I found and cooked up a recipe that I thought sounded absolutely amazing. As we'll see, I was totally wrong--the dish pretty much sucked. But with the use of recipe modification, I took what could have been a deeply upsetting cooking experience and turned it into a great addition to our collection of recipes. The original recipe, Chipotle Lime Bacon-Wrapped Shrimp, is from Simply Recipes, and it sounded so good I literally started drooling at my computer. Let’s take a quick look at what turned out to be a fatally flawed recipe. 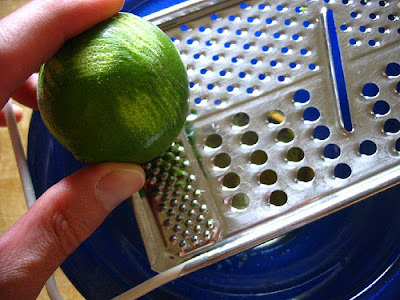 1) Mix together in a small bowl the lime zest, lime juice, olive oil, and chipotle powder. 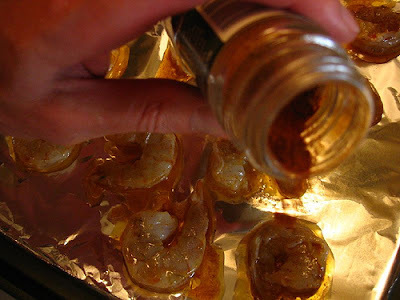 Put the shrimp in the lime chipotle mixture; make sure each piece is well coated. 2) Prepare grill on high, direct heat (if grilling) or preheat the oven to 450°F. 3) Working one at a time, wrap a half piece of bacon around each piece of shrimp. If you are grilling, thread the shrimp onto long, flat skewers (flat skewers make turning the shrimp on the grill easier). If you don't have flat skewers, I've used two thin bamboo skewers (soaked in water for 30 minutes beforehand) to the same effect. If you are using the oven, secure the bacon onto the shrimp with toothpicks. Place the bacon-wrapped shrimp on a slotted baking pan (lined with foil inside for easy cleaning). Brush remaining lime chipotle mixture on the outside of the bacon-wrapped shrimp. 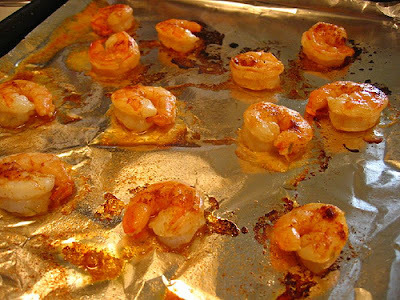 4) Grill uncovered for 5 to 7 minutes on each side, or bake in the oven for 10-14 minutes, until shrimp is pink and the bacon is crisp. I also have a profound weakness for shrimp. You’ll notice there’s a tag on this blog called “shrimpfetish”--so a recipe that combines both bacon and shrimp should draw me in for sure. Quite frankly, the idea of combining these two foods in one dish never occurred to me, and it sounded tantalizing. I was sucked in. I know now never to try that combination again. Here was the problem: After making the dish and sampling the goods, our conclusion was that this recipe was just overwhelmingly salty. Sadly, the bacon added nothing to the dish whatsoever--it just buried the shrimp as well as everything else. You couldn’t taste the lime, you couldn’t taste the chipotle. All you could taste was the bacon-y salt flavor (and we all know that using salt = cheating!). In short, it was a dish with zero subtlety. Of course I don’t mean to disparage Simply Recipes as a site. In fact, I recommend looking it over for its wide collection of diverse recipes. My point here is to show how, even with good due diligence and a critical eye, a tasty sounding new recipe can break your heart. At Casual Kitchen, we’ve come to some degree of acceptance that we will experience recipe flops every so often. We didn’t let this particular disappointment crush our spirit. Instead, this flop, combined with recipe modifications, yielded a brand new dish that turned out to be an amazing addition to our recipe collection. My hope is that by showing this example it will help you think of ways to rebound from the occasional but inevitable disappointments that come with trying new recipes. The next time this happens to you, you can bounce back too. So what did we do? First we made some key modifications. We removed the offending bacon and tripled the amount of chipotle powder. As Laura said when she first read the original recipe, “just 1/4 teaspoon of chipotle? 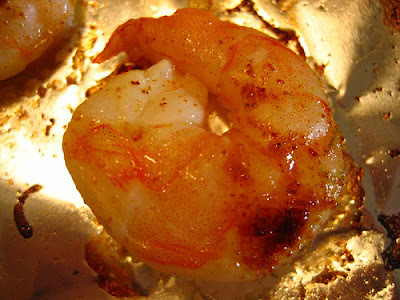 Why bother?” Then we shortened the cooking time (without the shielding from the bacon, the shrimp will obviously take much less time to cook—but please keep in mind that the cooking time is a variable that depends on the size of the shrimp!). 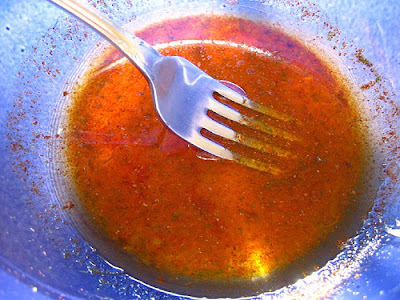 What these modifications yielded was an amazing shrimp marinade that contained a subtlety and spiciness that perfectly complemented a mild meat like shrimp. And the recipe in its modified form is far less messy and takes one-third the time to make. No more do you have to goo up your fingers wrapping bacon around individual shrimps. 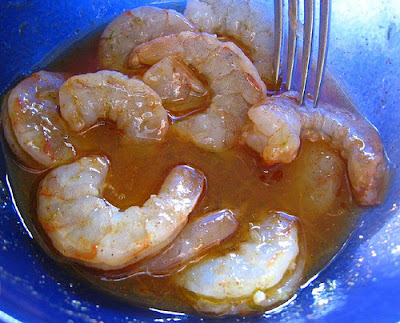 Instead you can mix up the marinade in a flash, drop the shrimp in, then bake, broil or grill them, and in minutes you have a delicious meal ready. Now that’s a recipe that passes the five easy questions! 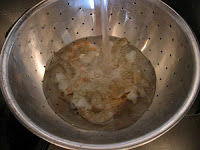 1) Rinse shrimp in cold water, then soak shrimp well in marinade for 5 minutes, making sure shrimp is well coated. 2) Place on skewers if grilling, or place shrimp on aluminum foil on a cookie sheet if baking or broiling. 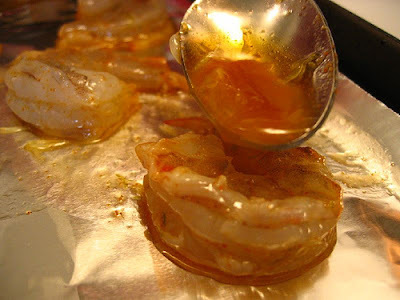 Spoon some of the excess marinade on top of the shrimp. 3) Grill 3-5 minutes on high heat, or until pink (don’t overcook!) or bake or broil in a preheated oven at 450F for 7-11 minutes until done. You never know what new and amazing experiences can come your way, even in the face of deep disappointments. Here's what the marinade looks like. What a deep rich red! I don't think the fact that you didn't like a recipe as written means that the recipe was a failure. It just means you didn't like it. I wouldn't like your variation -- too much heat for me. But that doesn't mean it's a failure. To me a recipe failure is when the recipe, as written, doesn't work. It's not cooked enough or cooked too much. Interesting point Sally, and I hear you. I suppose there are degrees of failure. If a recipe comes out burned, or raw, that's a clear failure. However, if there's no subtlety to the recipe (as in the case of this recipe in its pre-modified form--the entire recipe just tasted like bacon), or, if there's too much heat (how you would view my revised version) to me that's also a failed recipe--just not as severe, and of course depending on the taste buds of the cook. Thanks as always for your thoughts. I think I'll tag this for later with the intention of using your marinade recipe and some real bacon - low salt, nitrite free etc. 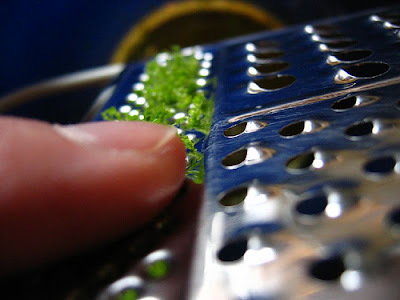 - cut into thin strips. That stuff doesn't have the overpowering (probably fake) baconiness that the regular bacon has. I'll have to wrap them like barber poles and it will be fussy but I'll only do a few and, as you did at first, I find the promise of seafood and aged pork too tantalising to refuse! I like that idea Lauren. Let me know how it comes out!